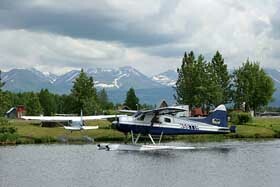 It is located next to Anchorage's Ted Stevens Int'l Airport and it is a place of constant activity. Although my visit to this area was limited, there would have been no excuse if I had ignored it! DeHavilland DHC-2 Beaver, the gracious bushplane, N101TE is its tailnumber. 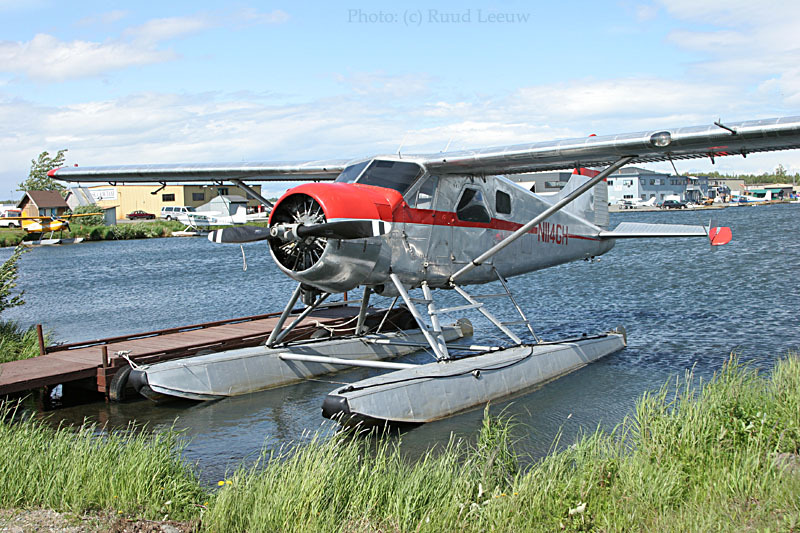 Not much is known about this airframe's early history, DHC-2.com notes it was converted by St. Cloud Aviation Inc. (in 1988) and they had their own c/n applied. Registered N126SC in those days? On 03Aug95 it was registered N101TE for Amber Aviation Inc. of Anchorage,AK and operating on an airworthiness certificate issued on 14Jun88. This is DeHavilland DHC-2 N456LC. C/n 434: delivered 15Jan53 as 51-16863 to the US Army (#1234, L-20 No: 235 - Command A-2). Tailnumber N6472 was applied in Jan72 for the Texas State Technical Institute. 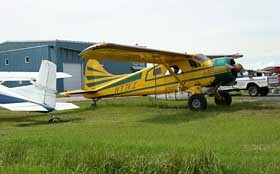 It became N456LC in Aug87 for Eager Beavers Inc. of Bismark,ND. It underwent a Wipaire conversion. Next we see a move to Whirlwind Aviation Inc.of Phoenix,AZ (date?) and Amber Aviation Ltd. of Anchorage,AK (Aug95). Reportedly for sale as of Sep04. I wonder what that contraption is slung underneath: an extra fueltank ? Going somewhere far away? DeHavilland DHC-2 c/n 950 was delivered on 25Jul56 as 55-3485 for the US Army (designated an L-20). It made its way to Europe for the Dutch Air Force ("Koninklijke Luchtmacht", serial S-1); its career ended there in 1974. It found its way back to the FAA Register as N9630A. Next was tailnumber N77KZ, being registered in Dec85. 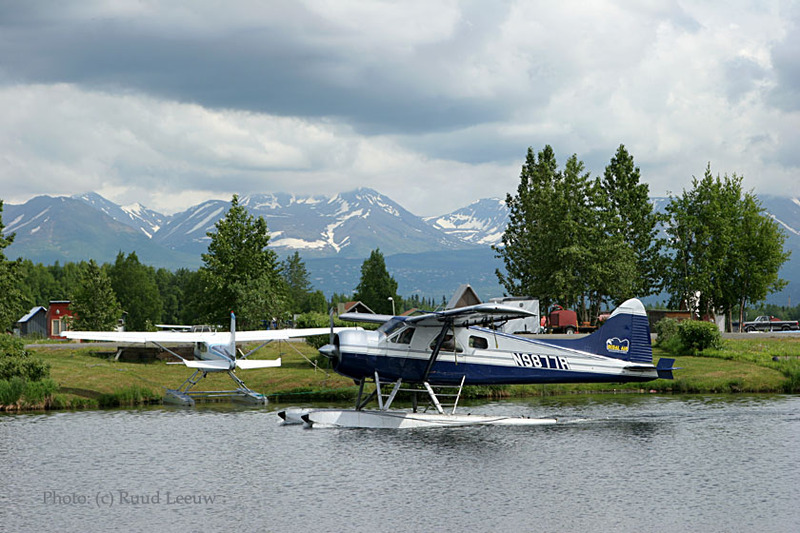 By Sep.2016 I learned N77KZ had been reg'd 19Mar16 to Michael Wade Renfro of Renfro's Alaskan Adventures in Bethel,AK (he also operates a Noorduyn Norseman - see HERE..). It was put on floats. delivered on 03Sep58 as 57-2580 to the US Army (L-20 Beaver, #1822); it was stored at Davis Monthan from 02Dec71 to 11Mar76 . It was registered to Rust's Flying Services Inc on 02Aug96. 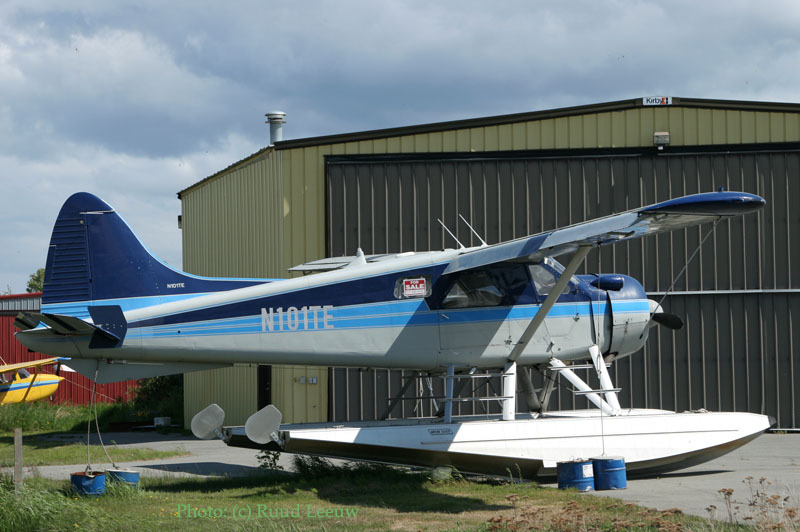 DHC-2 N114GH (c/n 380) rests here at the shores of Lake Hood and can look back at a life that started on 16Oct52 when it was delivered to the US Army as 51-16834. It was put in desert storage at Davis Monthan from 22May72 to 12Feb76, before it was registered as N9303Z to Cate Aircraft of Knoxville, TN (1976?). 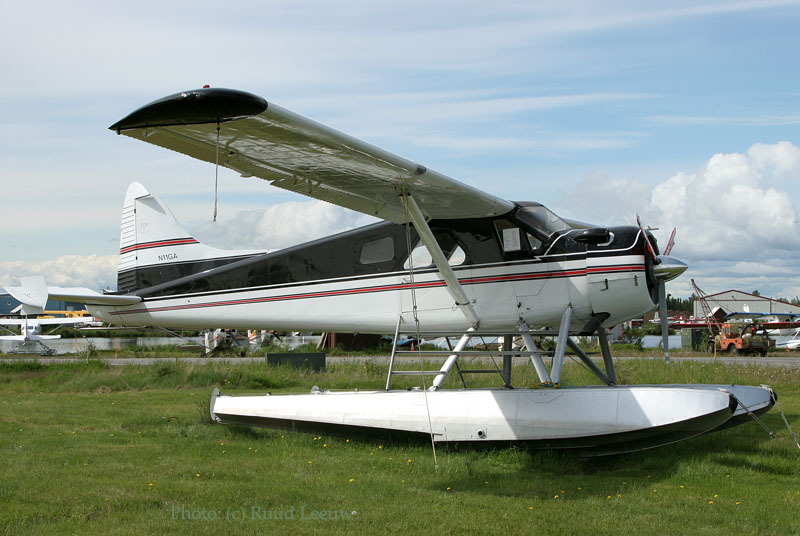 Next identity became N505LM (in Apr86) for Robert L. Magnuson of McGrath,AK. 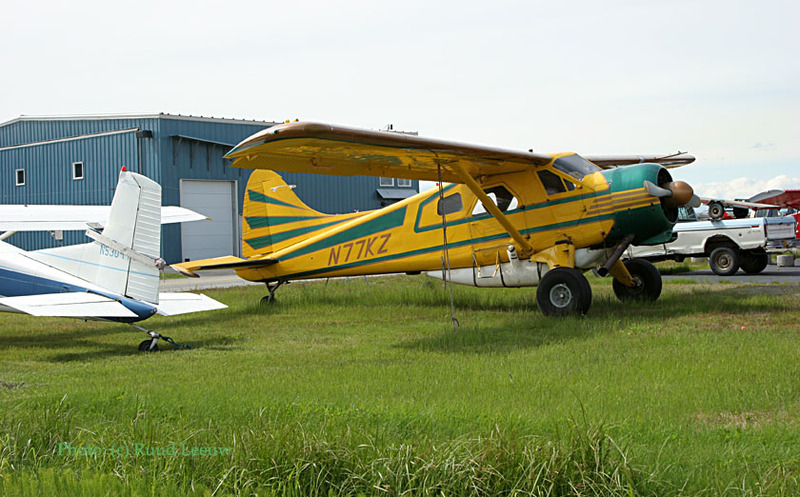 The next owner became O. Kay Barnum (of Anchorage,AK) who had tailnumber N114GA assigned to it. The aircraft crashed on take-off, Anchorage, AK 19May98 22:00 (though I could not find an NTSB report). 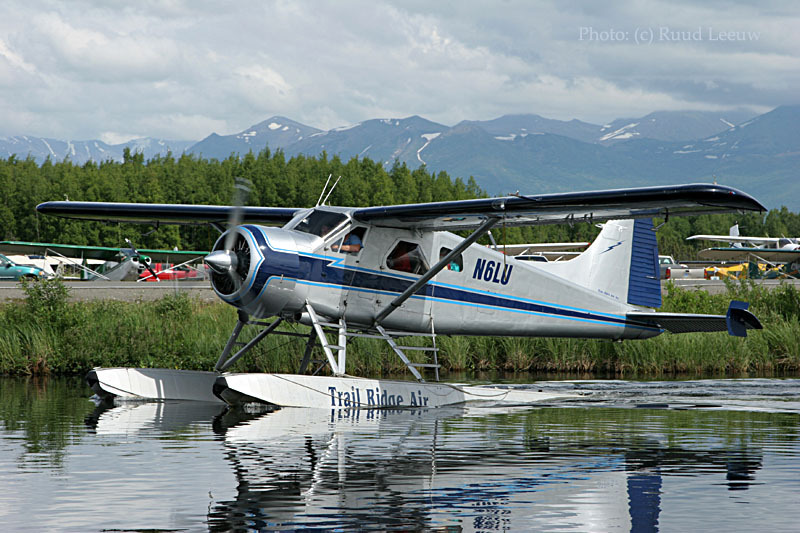 it present tailnumber N114GH was assigned on 11Jun98 to Phyllis H. Hankal of Anchorage, AK and it looks in great shape! 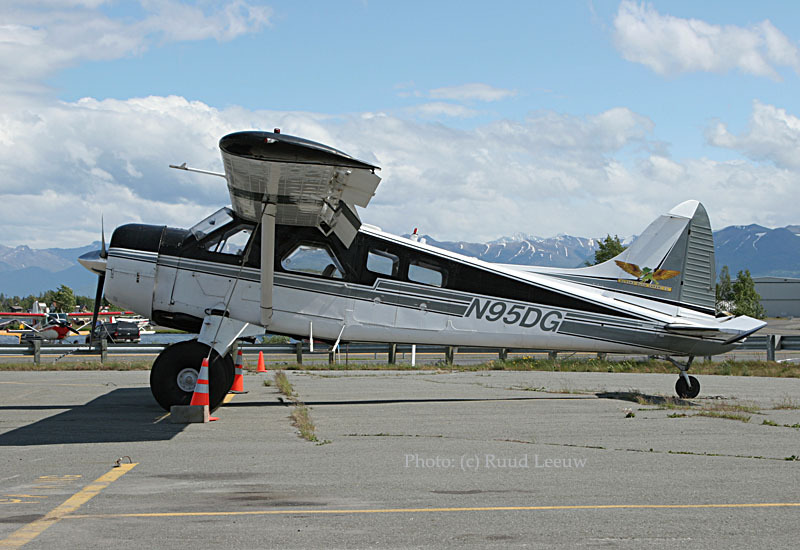 Here we see N95DG (DHC-2 c/n 572) parked on one of the ramps surrounding Lake Hood. It moved to Canada as C-GPVF for Steinwand's Transport Ltd. (Rae,NWT) in 1977. 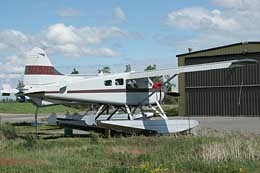 The next owner became Tyee and Baxter Airways Ltd of Nanaimo,BC (date?). 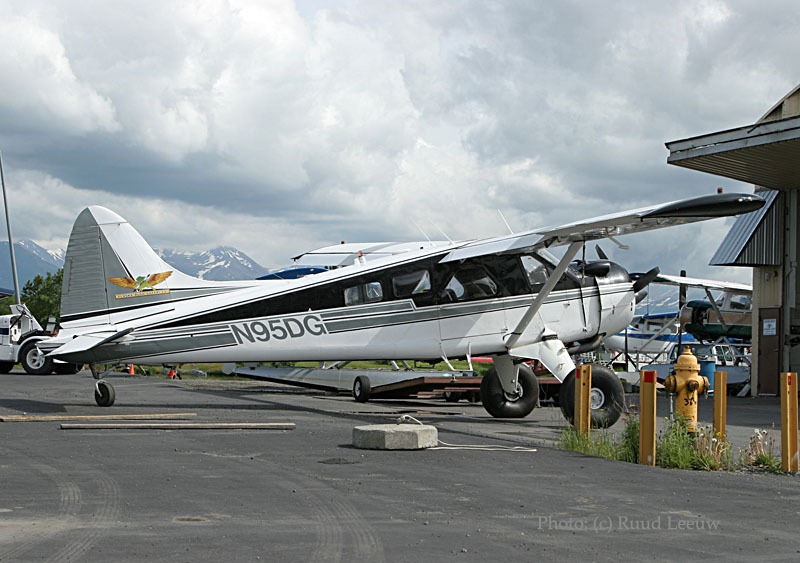 Its present tailnumber, N95DG, was assigned on 20Jun91 to Aircraft Marketing & Leasing of Fairbanks,AK but anno Nov.2006 this seems invalid as FAA's register for N95DG has the remark "Undel Tri" added, a sign the ownership is no longer current and/or the owner can no longer be contacted. You can see the wind is picking up... Weather can change quickly here in Alaska (but I've seen it raining days on end as well !). 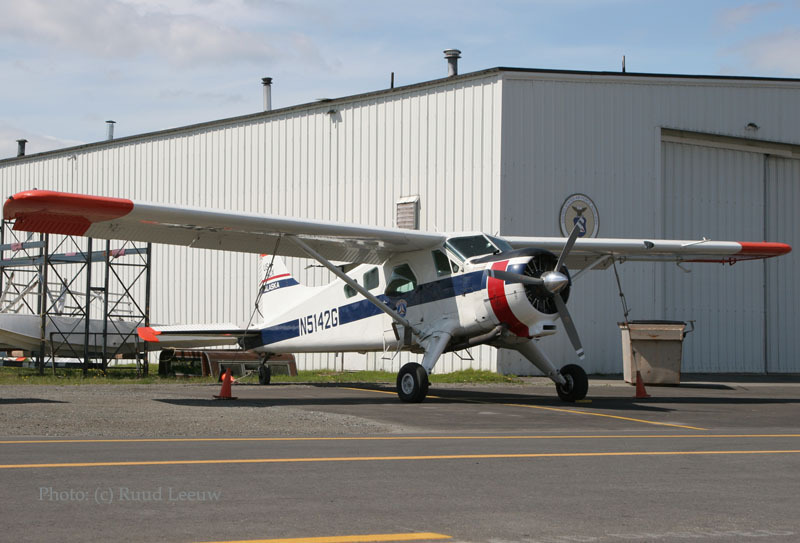 Delivered on 24Jun52 as 51-16511 (USAF) and now based in Alaska for the Civil Air Patrol (Hq on Maxwell AFB. in Montgomery,AL), registered N4793C on 18Sep68 ! 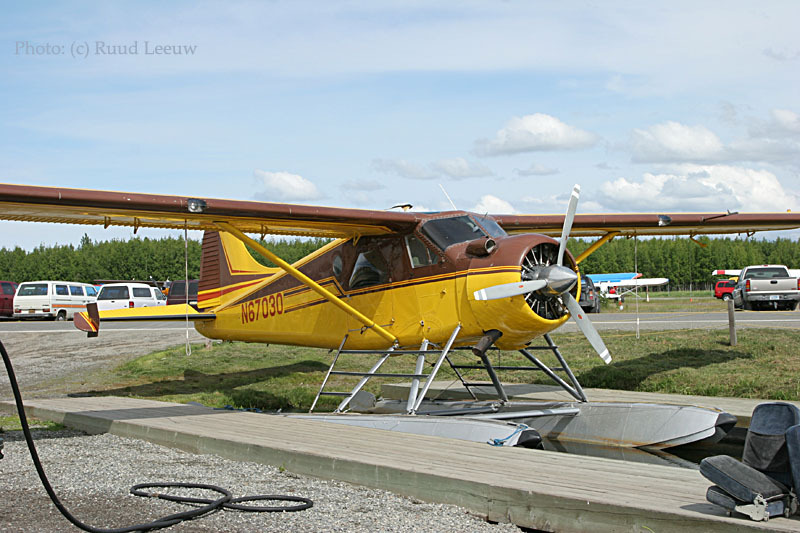 Last year, by Sep95, this proud bushplane had amassed a total of 7,990.8 hours. In april 2016 I learned that the CAP DHC-2s were offered for sale, they will be replaced by the GippsAero GA8 Airvan. N5146G and look at that magnificent backdrop! This DeHavilland Beaver has c/n 247 and was delivered as a L-20 Beaver on 01May52 with military serial 51-16487 (USAF). 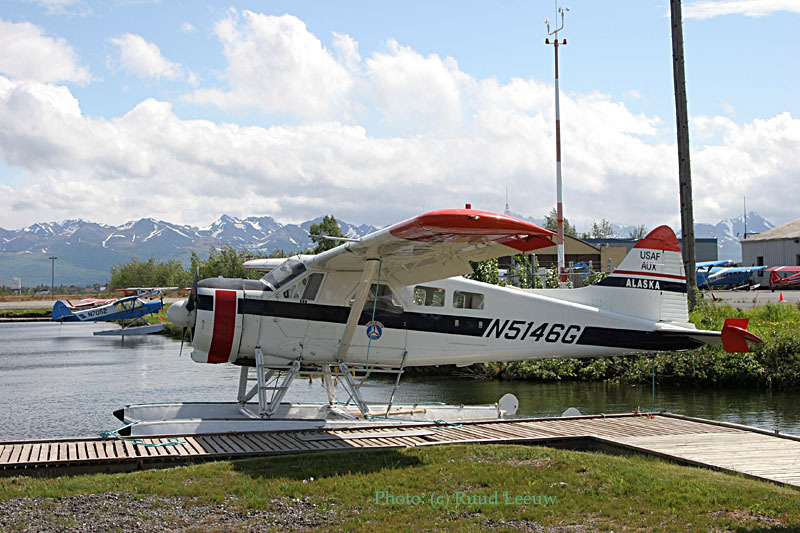 Tailnumber N5146G was assigned way back in May 1971 for the present owner and operator, the Civil Air Patrol Inc. (Hq at Maxwell AFB,Alabama) and is Alaska based. Data on N5146G on DHC-2.com stated it had amassed a total 10,781.0 flying hours by Sep.1995. It seems it was involved in an accident during step-taxi demonstration, on 23Jul06, but fortunately no injuries were reported; it did sustain substantial damage though; this happened on 7 Mile Lake, Alaska. DHC-2.com had it reported as "Status unknown", so it may be back in service since only recently. 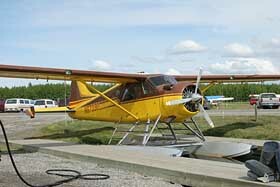 Martin Prince Jr sent me some photos while it was on a visit at Hangar Lake, Bethel (AK) in Aug07. Another fine specimen: this is c/n 481 with registration N5142G. It was delivered on 06Apr53 as 52-6105 (USAF, type designation L-20) It became N5142G for Civil Air Patrol Inc.on 20Oct70. 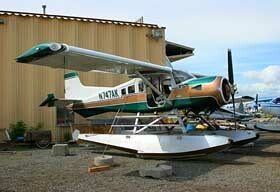 DHC-2.com has it showing a total of 9,410.7 flying hours by Sep95. The Civil Air Patrol is a non-profit organization and is also known as The Auxiliary of the U.S. Air Force. CAP has over 58,000 members (including 27,000 cadets ages 12- 21), covers 8 geographic regions, 52 wings, 1,700 units.. It has the world’s largest fleet (550) of single-engine, piston aircraft. Some kitchen equipment is waiting to be loaded on N454SP c/n 1193). N454SP was moored near the park on Lake Spenard, on Lakeshore Drive. This DHC-2 / L-20 was delivered 21Feb58 as 56-4443 to the US Army, but was stored at Davis-Monthan AFB during the period 21Feb72 to 12Feb76. It entered "civvie street" as N3067F, but this was cancelled on 28May76. It moved to Canada in 1976 and saw it registered as C-GEZV in July 1976. I am not sure if this was to Green Airways Ltd of Red Lake,ONT who also became an owner (this was cancelled on 05Jul84). C-GEZV continued its career with Air Roberval Limitée of Roberval,QUE, which had it registered on 19Oct84. 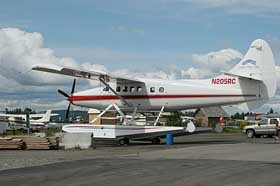 Next was Aviation Québec Labrador Limitée (Sept Iles,QUE), as of 07Oct93. It returned to Air Roberval Ltd on 08Feb94. 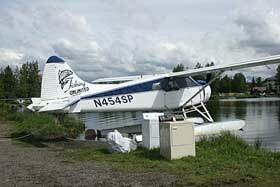 Then it went further up north, to Alaska and became N454SP for S.P. Aero of Anchorage. this seems to have taken place during Feb95. 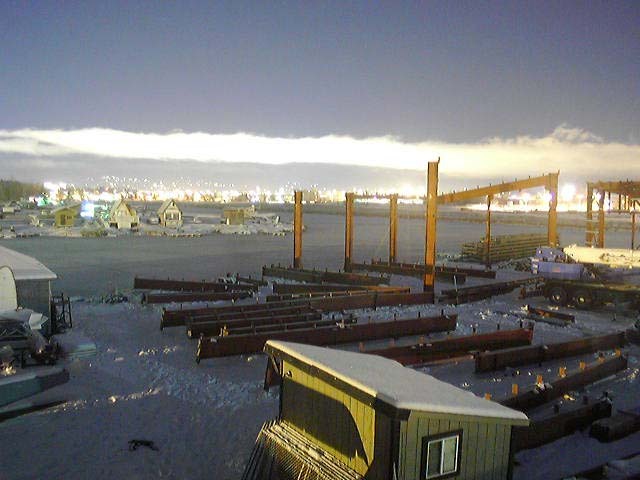 And maybe these refrigerators are destined for its present owner: Alaska Lodges Inc (Anchorage, AK; registered 30Jan01). DHC-2	(c/n 448) N768 is seen parked on the Lake Hood airstrip, slightly to the northwest of the lake. Its aviation history started with delivery by DeHavilland of Canada on 22Jan53 as 52-6083 to the USAF, designated a L-20 Beaver (No:246). It obtained its present identity of N768 for the US Department of the Interior in ca. 1970. 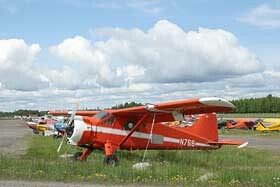 Kenneth Darwin Wright of Anchorage had it registered to his name on 27Dec78, however FAA's online records show the remark "Undel Tri" (Undeliverable Triennial - indicates a Triennial Aircraft Registration Report was returned by the Post Office as undeliverable) so it must be considered not current. Its history dates from its delivery on 29Jul59 as 58-2040 (US Army, type L-20 Beaver, no:921) and saw its career terminated upon storage at Davis Monthan AFB,AZ (07Feb72 to 11Apr75). Next was Ken Spray Inc. of Twin Falls,ID (again, no date). Thomas I. Carlin had it registered to his name in Feb. 1992. And the Chelatna Lake Lodge Inc. of Anchorage,AK had it registered on 14Jan92, which is current to this day. This smart looking Beaver is c/n 1135 , presently registered as N9878R. Crashed and burned 18Jul2018, pilot killed. It was delivered, like so many, to the US Army (on 09Sep57, as 56-0398). N5878 became its first civilian identity (but to whom and when?). Next was N88788, registered on 05Jun73 but I don't know to whom. And N9878R entered the books in May 1991, I suppose to Craig M. & Sarah A. Elg / Regal Air of Anchorage, AK. And C & S Leasing Inc. (Anchorage,AK) became the next owner, but I have no date and I expect it was some sort of sale/leaseback as it was still operated by Regal Air here. 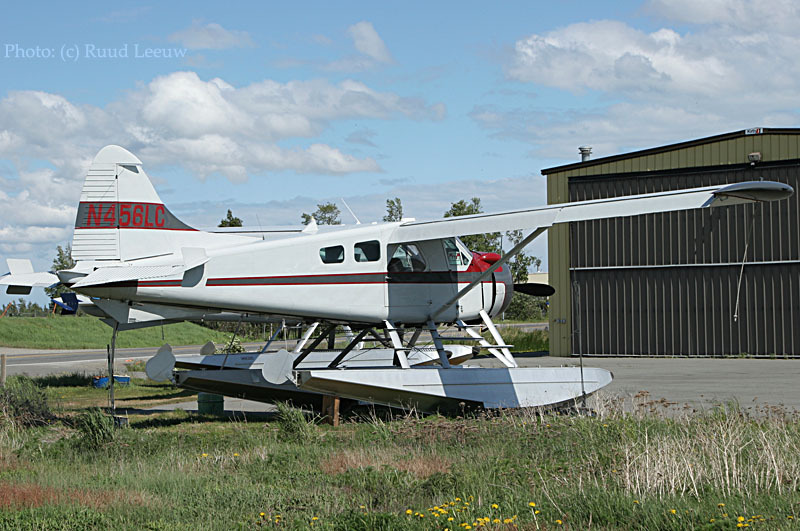 When I checked FAA's online website I noticed N9878R had been registered to Laughlin Acquisitions LLC, 4506 Lake Shore Dr, Anchorage since 15Aug05; as such it is operated by Regal Air. N6LU is DHC-2 c/n 908. 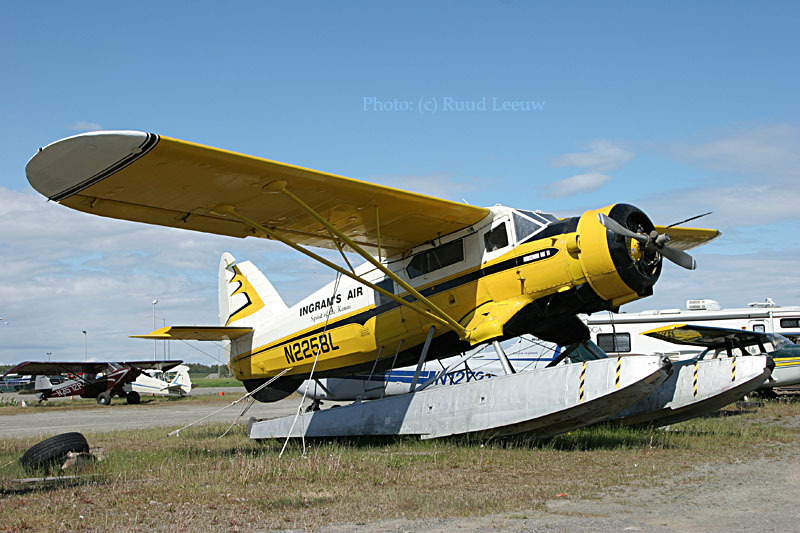 It was delivered on 09Apr56 and names of owners read as Taxi Air Group Inc (as N97T) and Shell Aviation Corp. of Cordova,AK. Tom Parker of Cordova,AK had it registered in Aug69 and it became N6LU for Lake Union Air Service Inc. (Lake Union / Seattle,WA), but I have no date for this. Goeffrey D. Armstrong of Anchorage,AK entered the books as owner in Aug94. When I compiled this webpage (Nov06) I found FAA's website showing James M.Jensen (Anchorage) registered as owner since 13Apr99. 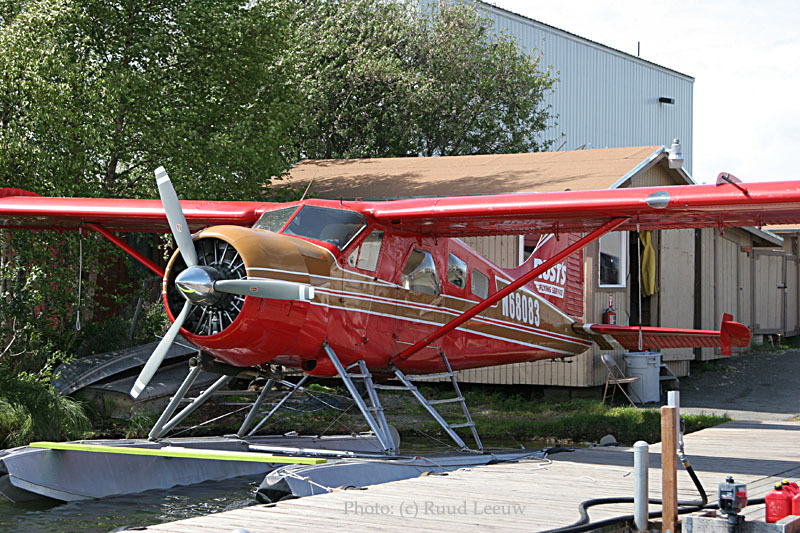 High and dry sits DHC-2 Beaver N11GA (with the remarkable c/n 1111). Its delivery date was on 21Jun57, as 56-0388 to the US Army (another L-20). It was noted on 12May60 at London-Gatwick in the UK! Terry R.Willis of Ward Cove,AK had it registered in Dec91. Next was Ultimate Air LLC. (Anchorage,AK) took ownership on 18Jul03. Quite recently Louis R.Gold (Fairbanks,AK) had it registered on 12Sep06. 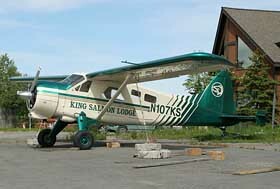 Owner: KING SALMON LODGE AERO 1 LLC (Anchorage,AK) R11Feb05. 6110 (c/n 488/1272) to civil registry as N311NR. Registration N107KS reserved 11Feb05. Serial block 52-6059/6161 were all DeHavilland L-20A Beavers, redesignated U-6A in 1962; these planes received a dual c/n system, a factory number and a number assigned to planes produced specificially for USAF/US Army. 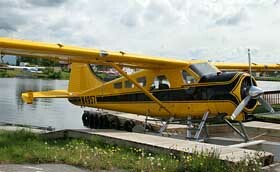 This Turbine Otter has tailnumber N205RC and is registered to Rapids Camp Lodge Inc of Dallas TX, since 23Jun05 (c/n 201). I would welcome more info on its history, such as to owners / operators during the days of DHC-3 and when it was converted. This is DHC-2 c/n 490, which was delivered by DeHavilland Canada on 22Apr53 as 52-6112 to the USAF; the 52- part of its serial signifies the order was funded in fiscal year 1952. Its transition from a military career to a civilian seems hazy, but N5579D was found in USCAR 03Nov90 as “sale reported”. Things get more tangible when it was recorded as N4957 for the State of Maine Forestry Department in Sep71. It even became museum material when it went to the Mid Atlantic Air Museum Inc. of Middletown,PA (date?) and the Museum at Reading Airport,PA. (again: date?) in USAF markings 26112 LG-112. DHC-2.com has some interesting photos in this livery. But it was too soon to retire and on 07Mar97 we see N4957 registered to Steve Lacombe of Hessmer,LA. Joe Furgerson of Sunnyvale,CA became the next owner on 09Apr03. 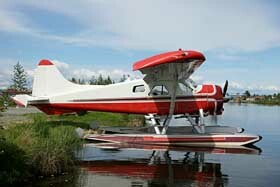 This DHC-2 Beaver in its attractive red/white livery is c/n 658, presently registered as N5162G. It was delivered on 14Jun54 as 53-8164 to the US Army. 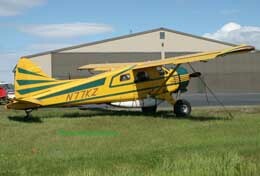 It was registered N5162G in May 1971 for the Civil Air Patrol. 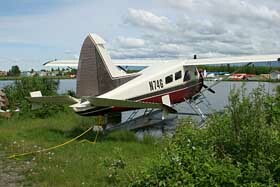 But where above Beavers remained faithful, this one was bought by Alaska River Safaris in 1981. It is registered to Walter G. Hanni of Anchorage,AK since… 25Jun84 ! 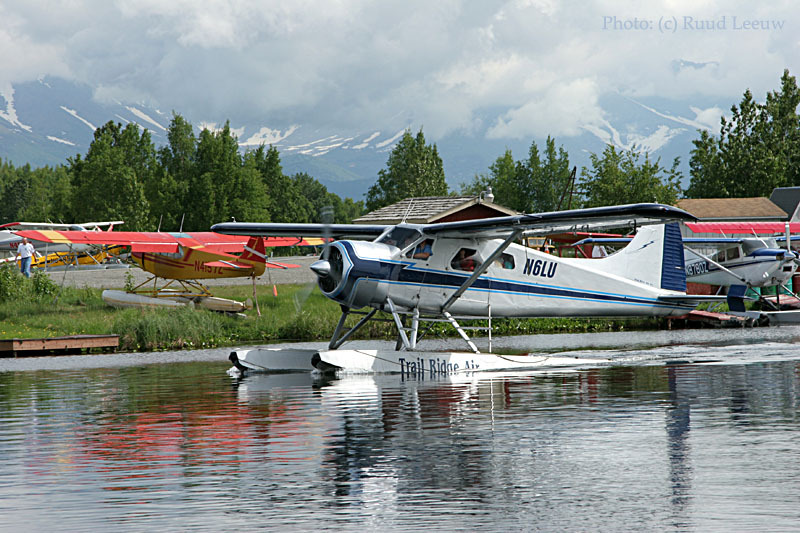 DHC-2 N9877R is making its way in the canal that seperates Lake Spenard and Lake Hood (though the entire lake is referred to by most as Lake Hood). This is c/n 1180 and it was delivered on 20Dec57 as 56-4436 to the US Army, designated L-20. It found itself stored at Davis Monthan AFB in Arizona from 25Sep75 to 28Apr76. It was entered in the FAA’s records as N3225F in May 1976 for Civil Defense of Jacksonville,FL. It moved to Alaska as N98JT for West Alaskan Outfitters Inc. of Soldotna in June 1986. Next owner was Michael J.Yorke of Chugiakge,AK in Dec93. Its present tailnumber N9877R was issued for C & S Leasing Inc. of Anchorage,AK, which was registered on 11Feb98. But it seems firmly in use by Regal Air; when I checked FAA’s website I found it was registered to Laughlin Acquisitions LLC (Anchorage,AK) since 15Aug05. I like these short tailnumbers: N74G ! This is L-20 Beaver c/n 1015, which too saw its career start with the military: delivered on 03Jan57 as 55-4612 to the US Army. Its first civilian tailnumber was N36841, which was registered in 1976. I don’t know what happened but its airworthiness certificate stems from 08Dec89. Maybe Ronald O.Kakeldey of Anchorage,AK had something to do with this as he was an early owner and he seems a capable manufacturer (see below). 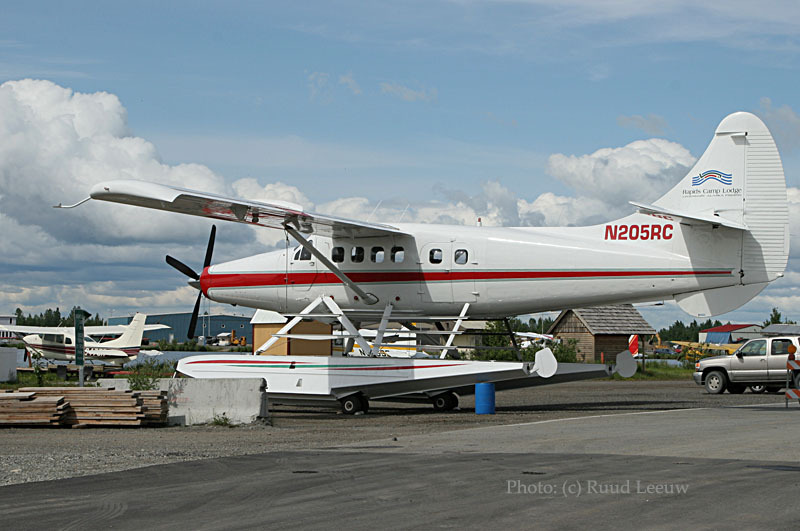 But N74G was sold to R & J Aircraft Leasing Corporation of Anchorage,AK at some point (date?). 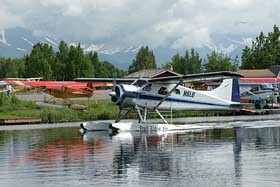 And next we see N74G registered to Michael K.Schilling of Kenai,AK on 29Jun01. 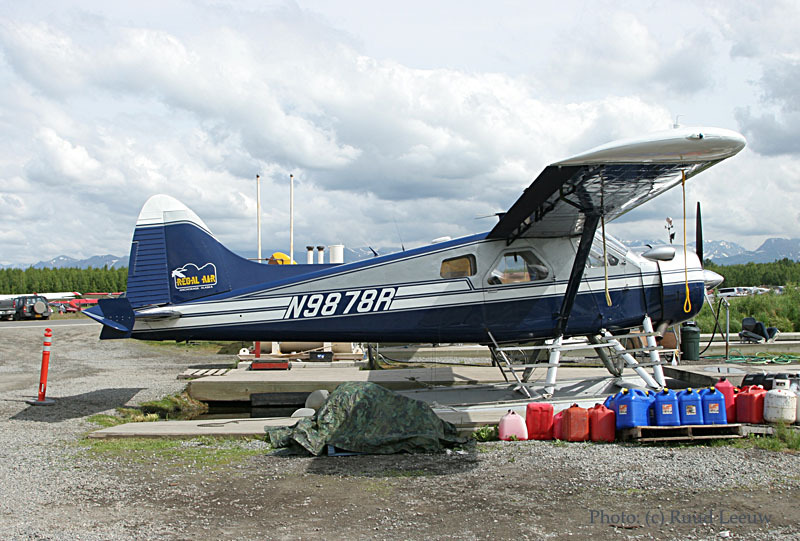 On FAA’s website I found N74G registered to Jack B.Duclos of Anchorage,AK since 25May05. It looks like... but it isn't! 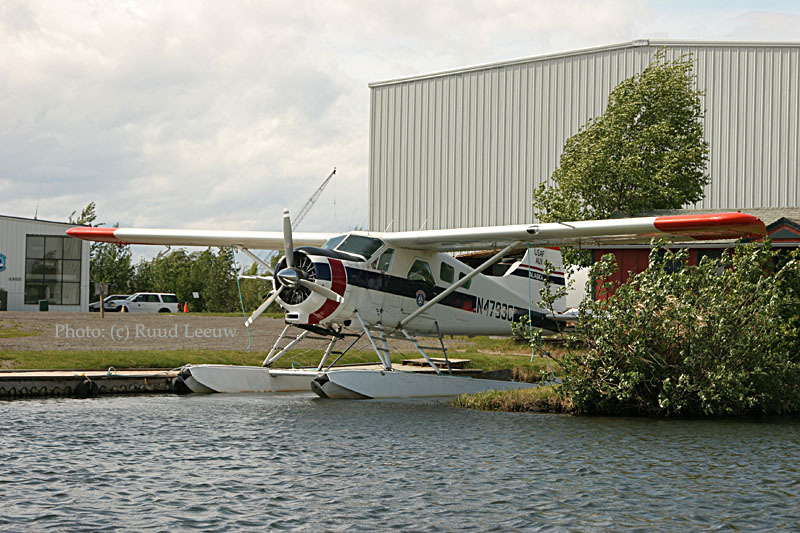 N747AK was built by and registered to Ronald O Kakeldey (Anchorage,AK) on 23Jun03 (Classification: Experimental; Category: Amateur built, mfr 2003). We saw the name Ronald Kakeldey also appear as former owner of N74G (see above). I came across another one at Red Deer,ALB on 24Sep07 (scroll to almost bottom page). 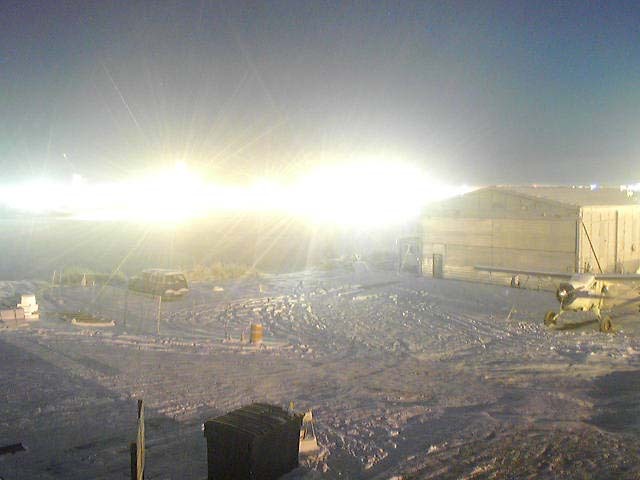 When I checked the webcam (see below) I found the temperature at 5 a.m. to be 7 degrees F / minus 14 degrees C on Nov.3rd 2006 and it showed some building in progress here.